Home » Research Library » Are dissonances and group agreement compatible? This past summer, I had the chance to be a participant/observer for IICSI’s Play Who You Are program: a partnership that places professional artists (primarily musicians and dancers) in the Rainbow Camp: KidsAbility group. Over the course of a week, the artists facilitate spaces of improvisatory practice with pre-adolescent to adolescent teens who have a varying range of physical and/or developmental needs. 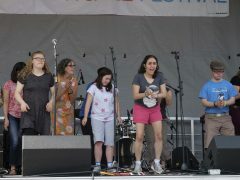 The weeklong session culminates in a performance for the parents, and then another performance again at the Guelph Jazz Festival, on the central stage. This program, now in its eleventh year, has had profound impacts on the campers, their parents, and the facilitators of the space. Play Who You Are participants self-report feeling confident, brave, excited, and proud of performing. Parents or guardians have expressed shock and delight when they see that their loved one is not only participating in the improvisation, but often choosing to solo on an instrument, or to be a central focus of the performance in some other way. The performances have varied over the years – primarily between movement or dance based components, and music, and the culminating performances have become a Guelph Jazz Festival favourite and staple. This year, a large number of Play Who You Are alumni and current session campers came out to the Guelph Jazz Festival to perform on the stage. These are all facts about the event and the program. One need only watch one of the Stories of Impact (Heather, Katy, and Talia) to recognize the real depth of experience this program facilitates. But, as with any nuanced space-making effort, especially with improvisation, there are also difficult components. The facilitators discussed difficult components during the Play Who You Are retrospective roundtable during the 2017 edition of the Guelph Jazz Festival colloquium. A series of similar themes came up repeatedly amongst the facilitators: That there was tension, and dissonance. That it was challenging. Certainly, at least for the session that I observed, there was tension. There were campers sitting out, leaving. There were crossed arms, there was embarrassment, and there was reluctance. And while engagement can and does take many forms, and there were those who participated happily, the actions of a not insignificant number of the campers were decidedly not engagement oriented (such as leaving the space completely). And there was also only a week to showcase what had been done, and a little longer then to perform it at the jazz festival. And while there were definitely pockets of improvisation-based moments and activities, the performance itself (or, more specifically, the process of getting towards that “outcome”) had become more of a curated sequence for those that would engage. This is not a bad thing, especially because being a participant first based program, those who did participate enjoyed themselves, and confirmed this verbally, sometimes even on film. One of the unique aspects of the Play Who You Are project (part of what makes it doubly so successful and at times challenging) is that there are a rotating group of people involved. Each year sees new facilitators, old facilitators, different experimentations with improvisation, guest facilitators, new and returning campers, new and old counsellors– such that the experience of the program is always different. Some years see more of an emphasis on structured free play. Others, like this past summer, involved experimenting with fewer (initially, virtually no) instruments, and a more free form approach. A challenge of facilitating improvisational space is finding the balance of constricted practice and free play. Too much structure becomes didactic, and stops being a space of improvisation. Without structure, the freedom and number of possibilities verges on oppressive. When there are too many things that could happen in an improvisatory space, participants become overwhelmed, and self-conscious. Without anything being communicated as certain (for instance, how long will the exercise last, what happens next, and moving with assuredness towards that), the multitude of possibilities can be stifling. In other words, spaces where there hasn’t been enough structure can go from being freeing, and a place to explore, to, paradoxically, scary feeling, and unsafe to really explore. Trying out different strategies as a guide through those spaces is important. But it’s also important to be able quickly to change the plan to match what the group dynamic, especially the outliers, may need to feel comfortable to explore. And some kind of careful engagement with the outliers, I think, is of equal, if not extra importance. Sitting out (leaving the activity, going to the sidelines, going outside, or being generally “outside the circle”) for example sometimes is and should be recognized as a form of participation. But what ought facilitators to do with that form of participation? And how can this fit in the bigger picture of “group agreement”? Sometimes the right move is to allow it to be. But then conversely, it is also important to reflect on whether or not there’s something in (or not in) the space that is alienating or preventing someone from engaging. Qualitatively, deliberatively, and experientially, there is a difference between sitting out because you need to, or just want to watch, and sitting out because there is no space for you. And the latter can be hard to read: did that happen through a detached and alienated exclusionary process? Or is it perhaps a potent, if unintended, signal to the facilitators? Engaging these dissonances in some way (even in a careful thinking through) is of utmost importance, especially when the space is facilitated with an inclination towards some kind of “group agreement.” By not engaging it, and by paying attention only to those who are “agreeing,” we end up perpetuating impulses of dominance in spaces, and furthermore, not trying new things. To take “agreement” in a broader sense, democratic agreement can actually perpetuate issues of, for instance, totalized opinion, or homogenous inertia – and it could very well be the case that the outliers would have the best insight on how to move forward. I am thinking here of powerful acts of civil disobedience that are analogous to “sitting out”– these are all different than sitting out because something about the space has prevented you from being able to make any choice. I think that to some degree, the pressures of our “finished product” culture mean that creating spaces of improvisatory practice become increasingly challenging as we find ourselves having to justify their existence to the powers that be. We turn to qualitative analysis, we point to the positives of how it can promote peaceful cohesion, we show the changes in confidence, and we get anxious when the spaces do not “feel as they should.” Especially as facilitators, pedagogues, or practitioners of improvisation, we are aware of tension and disengagement, sometimes even uneasy when there is not group agreement or cohesion. A space with marked tension is destabilizing. In other words: we become unsure around dissonance and difference, unsure as to where or how it can fit in the “bigger picture” of the group agreement. But in the spirit of promoting the importance and the positives, one thing that is really important to not lose sight of is that we cannot let these spaces become understood only as utilities. Facilitating a space of improvisation is an important tool, yes, for promoting togetherness. But the real truth underneath that is these spaces of connection, awareness, deep listening, and communication, are intrinsically worthwhile. And they are worthwhile because we, as beings, are different from each other. Thus the process of improvisation, and negotiation, becomes something that is an intrinsic, necessary condition of how we are. Improvised spaces, ideally, honour our subjectivities; working from our starting place of irrevocable difference, and learning to listen from that space. But they also involve the group, the other, and in doing so, acknowledge them. After all, the very concept of “negotiation” requires that there be more than one locus out from which negotiations occur. Play Who You Are involves filmed interview sessions, for those who’d like to speak about their experience in front of the camera. This year, one of these interviews involved a fifteen year old who, at the beginning of the week, seemed unlikely to want to interview, or even to participate in the activities. But she did participate, primarily, in the activities that had a clear description. Mid week, she also came, of her own volition, onto the camera to describe her experience. This can be interpreted as being a net positive from the program, seeing it as an instrument for her flourishing. This is not a bad way to see it. But an additional way to see it is that something happened in the space that empowered her to feel free and safe to explore; she was able to speak, from her perspective, on what she felt in the program. At one point, in one of the more structured parts of the program, she and I ended up together in an exercise where we had the temporary “power” to gently control how the other would move (e.g., I would tap her arm lightly or firmly, and she would move it according to how she ”read” that tap.) We had to attend to the non-verbal insinuations from each other, and interpret them. We had to yield some expectations of what each would mean, and remain firm with others. And that was, for me, a moment where our subjectivities were honoured across our differences—a truly successful moment of agreement.